What a gift this movie is! Truly one of the best movies of 2018 and 2019!!! The most visually stimulating and impressive footage of the ocean I have ever seen! Absolutely stunning!!! I could have sat there for many many hours watching these beautiful sea creatures. I loved it that we saw animals that I've never seen or heard of before but saw a few that are well known. Learned a lot from this film. Saw this as part of a special screening prior to it releasing this week. Do yourself a favour and spend the money and go see this in 3D. Even if just for the underwater scenes at night that are incredible. I am usually not much of a fan of 3D, but it is done very very well here. 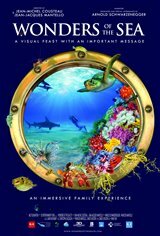 Spectacular visuals and amazing creatures examined in incredible detail, paired with an urgent environmental message. I took my 5 y.o. and it really inspired him- he is looking at single-use plastic in a whole new light, and ready to change the world!